It's Jason's birthday today. I am almost a year older than he is, but I always get giddy when his birthday rolls around. Why? Because for 5 whole days, he can't call me "old" without insulting himself, also. I do so love those 5 days out of the year when he has to bite his tongue! Anyhow, tomorrow is Allison's birthday, and with mine coming up on the 23rd, there's just too much cake shoved our way in such a short time frame. 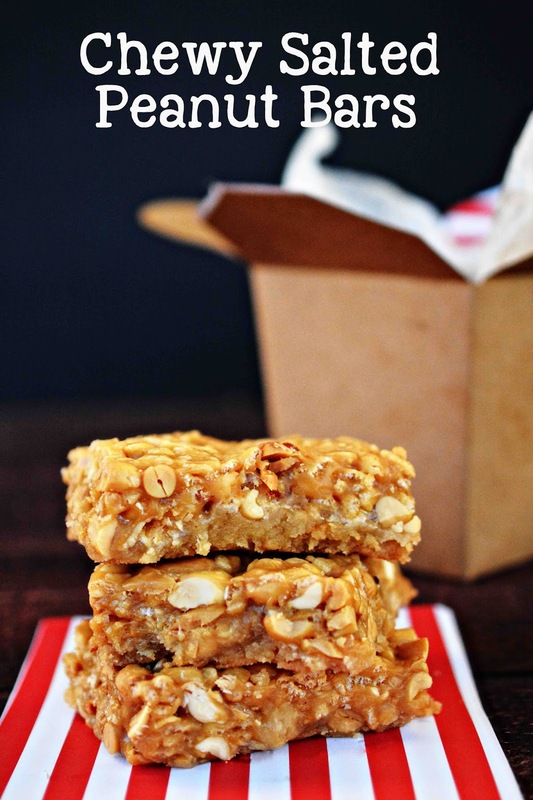 This year, I decided to do something a little different and make one of Jason's favorite peanut bar treats for his birthday instead of cake. It tastes a lot like Payday candy bars, so if you love Payday, you will surely love these homemade bars, too! Combine the flour, brown sugar and 1 cup of softened butter. Press into an ungreased 13x9 inch baking pan. Bake crust at 350 degrees for 15 minutes, or until lightly browned. Remove crust from oven, sprinkle marshmallows over baked crust, then return to the oven for 5 additional minutes or until marshmallows start to melt. Remove from oven and set aside. In a large saucepan, heat and stir the peanut butter chips, corn syrup, vanilla and 1/4 cup of butter until smooth. Remove from heat, then stir peanuts and cereal into the mixture. Pour over prepared crust, spreading evenly to cover. Allow bars to completely cool before cutting and serving. Store in an air-tight container. These would also make a lovely holiday gift, instead of cookies or candies. Just package them up in a cute little box, separate bars with some festive paper, and voila! Quick and easy holiday treat! Sounds like a yummy recipe! I will have to make these for my kids! Those look absolutely delicious! This would make the perfect breakfast bar or an on the go treat. Love it! These look really yummy! I love peanutty treats. so Jason got Allison one year for his birthday? How cool is that? Happy Bday to Jason and to Allison tomorrow! Looks like a yummy way to get a little nutty! :) I like your recipe and plan on trying it. These sound like awesome snacks! I'd love to wrap some up in a cute package and gift them as gifts! Who doesn't love that Payday taste? Hope all 3 of you have/had a happy birthday. New ideas to cake all the time is smart too, especially with three in a row. Any time you put salt, with nuts and something sweet; I'm there. Head over heals in love. YUM! Wow, busy birthday month, huh? Well Happy Birthday to Jason. I hope he enjoys his treats. I love the fact that it can easily be prepared. This will be a great snack for the kids. I am all about salty snacks so this would be a perfect thing to make for my office snack! These look so delicious. I am going to make them this weekend I am sure they will be a big hit. Those look like a pretty yummy sweet treat. Thank you for sharing - my boys would love this. These look really yummy. I haven't had a Pay Day in years. Now I'm gettin a serious craving! These would make a great treat! Happy Birthday! Happy birthday to the three of you. I like that you made one of his favorites for his birthday. That sounds like a yummy bar! I think it'd be a great dish to have for guests. "Because for 5 whole days, he can't call me "old" without insulting himself, also" <- Bwaha ha ha haa ha - me and my fave cousin go through this every year we are two weeks apart! I pinned this one for next year. It looks so good but I am baked right out!! A happy birthday to you all!!! Wanted to pop by and wish you and your family a VERY MERRY CHRISTMAS Theresa!! Hope this season is full of family and friends and a great New Year to you too! Cheers. 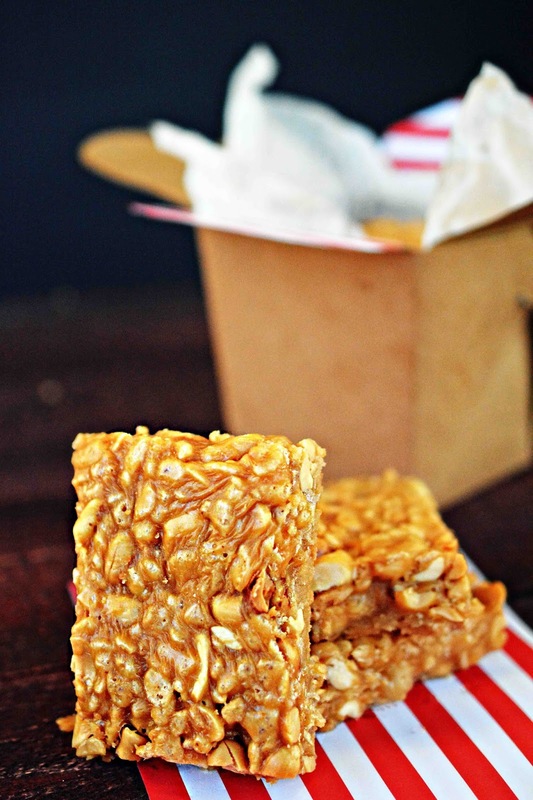 This is a tasty twist on the Rice Krispy treats. They look amazing. These look scrumptious! Thanks for sharing.